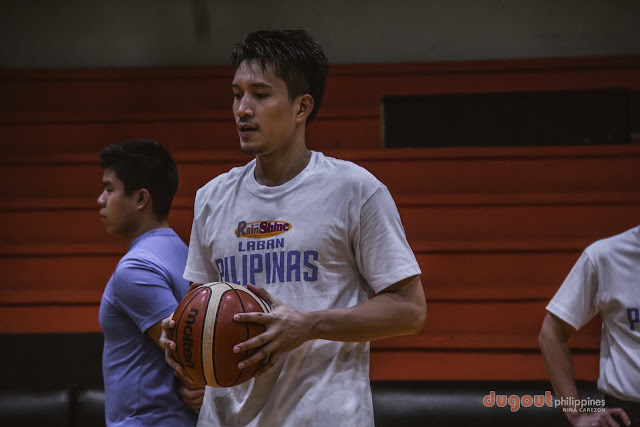 MANILA--James Yap was just 27 years old and was just starting to enter his prime when a national team call-up came. However, since then, it was never followed up, but not until this past week, when Coach Yeng Guiao, who was actually Yap's head coach in his last national team appearance, named him to the Gilas Pilipinas pool that will compete in the Asian Games and eventually to the Final 12. "Actually nagulat ako... kasi yun nga, sobrang tagal na. 2009 pa yung last," Yap, who at 36 is back with the Nationals, said right after Gilas' first practice on Monday night at the Meralco Gym. Despite the surprise call-up, Yap said that he is already gearing up for the challenge. "Lalo ako naging excited [kasi] ayun, may chance uli," he further said. As aforementioned, Yap's national team return came at the expense of a reunion with Guiao. "Ang kagandahan kay Coach Yeng, magaling magbigay ng instruction yan sa mga player," Yap commented on Guiao's coaching style, which somehow explains why he was able to develop the likes of Beau Belga, who was also named to the team, and former Gilas star Larry Fonacier among others. In the process, Yap reunited as well with Ryan Gregorio, his head coach at Magnolia, formerly Purefoods Chunkee, who now acts as one of Guiao's assistants. "Masaya siya na nakita niya ako dito," Yap relayed how their conversation with Gregorio went. With the national team lineup consisting of a good mix of veterans and young guns, Yap, despite only making a national team return after nine years, said that he will bank on his veteran smarts to help Gilas in its cause. "Ang gagamitin natin doon ay experience lang. Medyo nasa kundisyon pa naman," concluded Yap.